While Alice was living on the streets of California, she accidentally ingested acid and ended up with terrible chemical burns to her face and mouth. 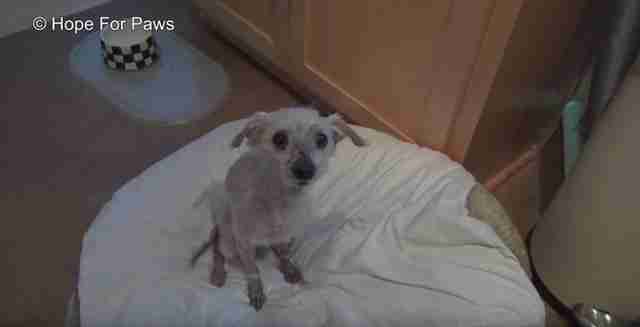 As soon as they heard about her plight, rescuers with Hope for Paws rushed out to help her, hoping it wasn’t too late for the poor little dog. When Eldad Hagar and Loreta Frankonyte arrived at where Alice had been spotted, they were shocked at the condition she was in. Someone had put out some food for her, but she was so injured, she could barely eat at all. 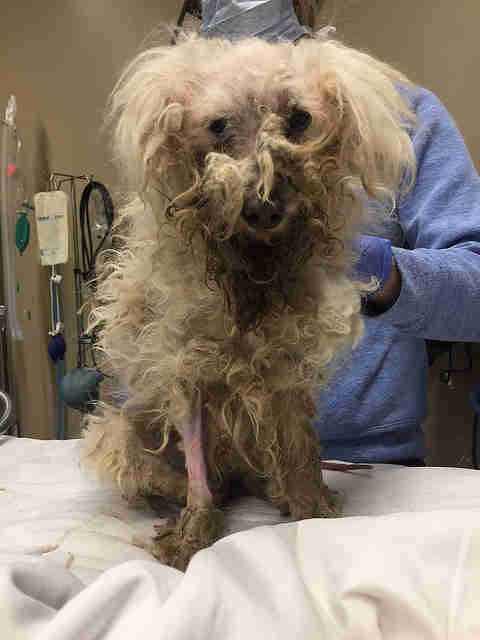 Besides her injuries, Alice’s fur was dirty, matted and covered in ticks, and she was incredibly skinny. Alice was so defeated that she barely even flinched when Frankonyte began to pet her, and she calmly let Frankonyte slip a leash around her neck. She was clearly very scared, but also seemed relieved that someone had finally noticed her. After a few minutes, Frankonyte lifted Alice up and carefully carried her back to the rescuers’ car. 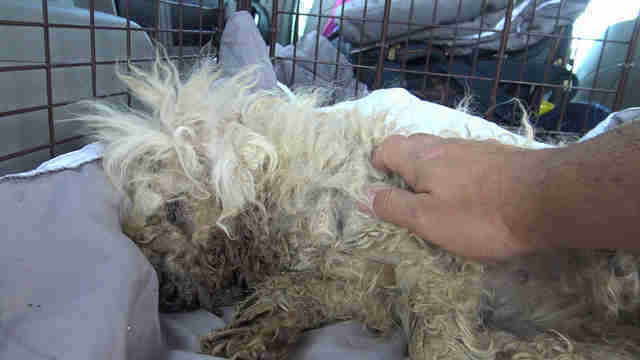 Once she was settled into the back of the car, Alice began to relax, and snuggled up in the blankets her rescuers gave her. She even rolled onto her back for some belly rubs, and she seemed to understand that these people were trying to help her. Frankonyte and Hagar rushed Alice to the vet as quickly as they could, and after examining her and her injuries, they determined that she was suffering from chemical burns, corneal ulcers, anemia and a heart murmur. She would also need extensive dental surgery to remove most of her teeth. They then gently shaved off all her matted fur, revealing just how skinny she really was underneath. Her body temperature was so low that they couldn’t give her a bath, so they rubbed her down with warm, damp towels instead until she had healed a little. 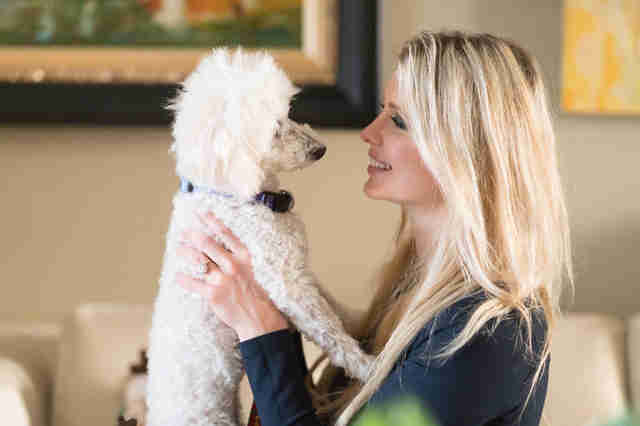 The little fighter of a dog spent a week at the hospital under close medical supervision. Frankonyte came to visit her every day, and eventually decided to foster her for a while to teach her how to live in a home and to show her what it’s like to be loved. Two months later, Alice was already feeling much better, so when Frankonyte and Hagar had to leave town for a few days to help out with another rescue, they asked their friends Chris and Michele Gentry — who had previously adopted another dog they’d rescued — to watch Alice while they were gone. By the time Frankonyte and Hagar returned, the couple had fallen completely in love with little Alice — and asked if they could officially adopt her. Now, Alice is absolutely loving life in her forever home. She has so much fur now and has put on so much weight that she looks like a completely different dog. She gets along wonderfully with her new sister Fiona, and her rescuers come to visit her frequently to remind her just how many people she has in her life who love her unconditionally. “This is such an amazing ending to this story and we couldn't be happier for everybody,” Hagar said.